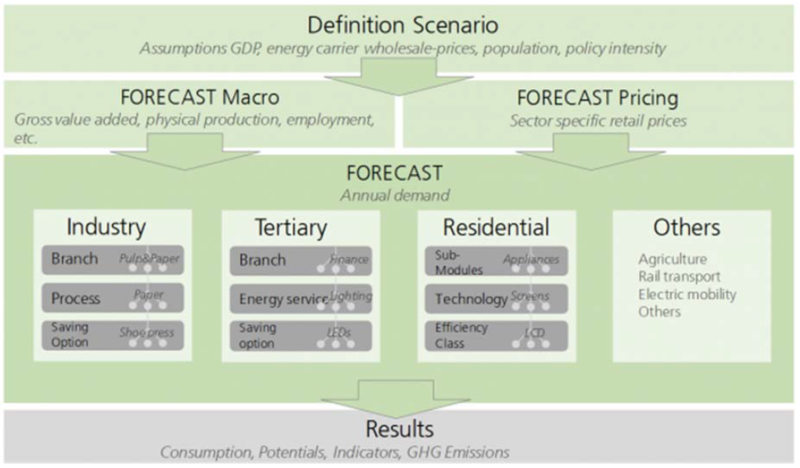 The FORECAST model is primarily responsible to provide projections of the future energy demand, considering different type of demand related policies and consumer prices. Consumer prices are derived from market models’ output (e.g. wholesale electricity prices from ELTRAMOD) and take into account the impacts of policy, regulation and structural change on the transmission and distribution grid. Demand projections cover all energy carriers and are available on an annual basis. Electricity demand is further transformed into hourly load curves in the eLOAD model, taking into account DSM potentials as a function of consumer price tariffs. eLOAD’s output serves as input for the electricity market models ELTRAMOD and PowerACE. 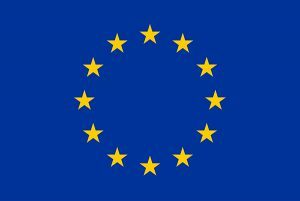 The FORECAST modelling platform aims to develop long-term scenarios for future energy demand of individual countries and world regions until 2050. It is based on a bottom-up modelling approach considering the dynamics of technologies and socio-economic drivers. The model allows to address various research questions related to energy demand including scenarios for the future demand of individual energy carriers like electricity or natural gas, calculating energy saving potentials and the impact on greenhouse gas (GHG) emissions as well as abatement cost curves and ex-ante policy impact assessments. The FORECAST platform comprises four individual modules, each representing one sector according to the Eurostat (or national) energy balances: industry, services/tertiary, residential and others (agriculture and transport). While all sector modules follow a similar bottom-up methodology, they also consider the particularities of each sector like technology structure, heterogeneity of actors and data availability. The list of selected input data as shown in the following table provides a broad idea of the level of detail of each module. Each sector requires sector specific activity data, like industrial production in the industry sector and the number of households in the residential sector. Furthermore, end-consumer energy prices play an important role in each sector as they are distinguished by energy carrier. The third group of input data, the technology characterisation also reflects data availability of the individual sectors. 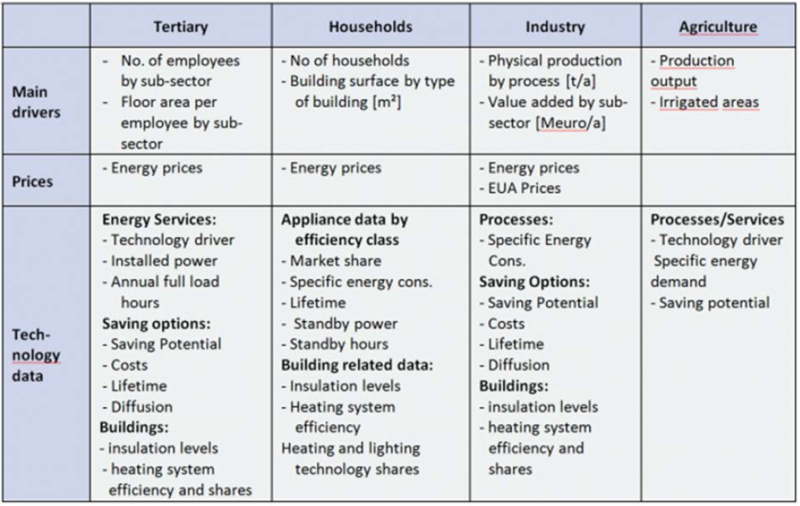 While in the industry and tertiary sector the model works with so-called energy-efficiency measures (EEMs), which represent all kinds of actions that reduce specific energy consumption, in the residential sector the stock of alternative appliances and the market share of different efficiency classes is explicitly modelled. In all cases, energy savings can be calculated and traced back to technological dynamics including cost considerations. In this project, the FORECAST model is primarily responsible to provide projections of the future energy demand, considering different type of demand related policies. The demand projections cover different energy carriers and are available on an annual basis. The electricity demand is further transformed into hourly load curves by the eLOAD model and serves as input for all electricity market models, such as ELTRAMOD pr PowerACE. Given that FORECAST is a bottom-up simulation model, the demand projections may be further distinguished by economic sector, process or appliance, technology and even efficiency class. Based on this very detailed information, the eLOAD model is capable to derive process discrete load curves and demand response potentials. Further data exchange takes place with the TIMES-Heat model with respect to energy end user prices. They are generated in FORECAST, taking into account the overall scenario story line and political framework conditions. They are used for the internal investment decision calculation performed to determine the future dissemination of technologies. Within the project, the generated insights about learning curves, in particular with respect to new energy efficiency technologies, will be integrated to further enhance the accuracy and consistency of the simulation approach and consider technological cost reduction in the underlying investment decision. Braungardt, S.; Elsland, R.; Dehler, J.: Modelling the effect of the Ecodesign and Labelling directives – Bottom-up analysis of EU-27 residential electricity use, International Energy Policy & Programme Evaluation Conference, Berlin, 2014. Elsland, R.; Peksen, I.; Wietschel, M.: Are internal heat gains underestimated in thermal performance evaluation of buildings?, Energy Procedia, Karlsruhe, 2014. Elsland, R.; Bradke, H., Wietschel, M.: Analysing the impact of Eco-Design requirements on heating systems – A European case study, 9th Conference on Energy Economics and Technology (ENERDAY), Dresden, 2014. Herbst, A., Biere, D., Fleiter, T., Jochem, E., Schade, W., Krail, M., and Kühn, A.: Coupling of ASTRA and Forecast Industry: A case study for the basic metals industry , ESA2 Short Report, Fraunhofer ISI Karlsruhe, Germany, 2014. Herbst, A.; Fleiter, T.; Jochem, E.: Modelling recycling and material efficiency trends in the European steel industry. Conference Contribution and Presentation. ECEEE industrial summer study. Arnhem, The Netherlands, 2014. Elsland, R.; Divrak, C.; Fleiter, T.; Wietschel, M.: The Turkish energy efficiency strategy – ex-ante assessment for the residential sector: 7th International Conference on Energy Efficiency in Domestic Appliances and Lighting (EEDAL), Coimbra, 2013.